It is the perfect place for a relaxing start to a wedding or to house special guests who may require a private space before the main event. Bridal parties can prepare here and have their pre-ceremony photographs taken in the luxurious surroundings. Available throughout the day and as needed, these rooms provide a comfortable private space. Wren House can also accommodate intimate wedding dinners and receptions. 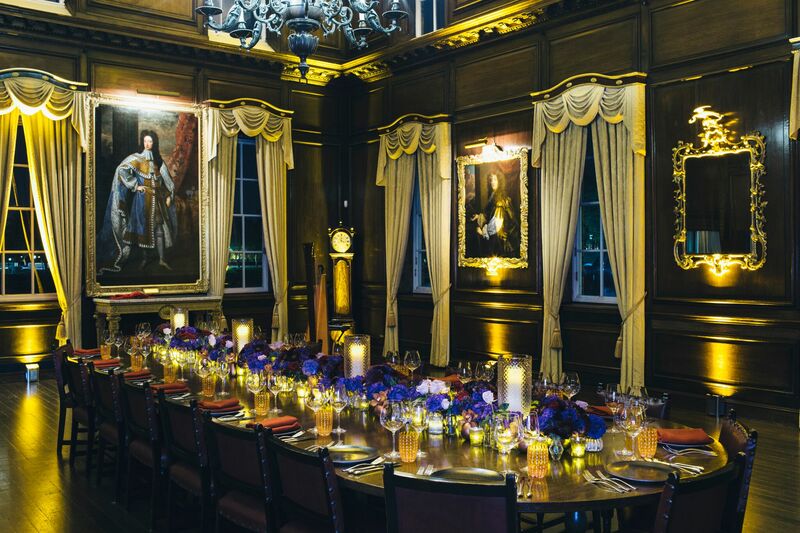 The elegant Figure Court lies at the very heart of Wren’s original design for the Royal Hospital Chelsea. Bordered by the State Apartments, the Chapel and the Great Hall, the courtyard space is dominated by the inspiring gilded statue of Charles II, created by Grinling Gibbons and presented to the King in 1682. The imposing outside space is available as an extension of the Great Hall venue. Commissioned by King Charles 2nd and designed by Sir Christopher Wren over 300 years ago, Wren’s Baroque chapel sits at the heart of his original buildings and is a rare example of his pure ecclesiastical style, retaining the original wainscotting, pews and plasterwork. It is a perfect setting for weddings and christenings. The Chapel is available to hire only in conjunction with another venue space and can seat up to 400 people. Sebastiano Ricci’s mural ‘The Resurrection’ creates a stunning backdrop to this beautiful venue. In a secluded and picturesque part of the Royal Hospital estate is the charming Ranelagh Gardens. The gardens form part of the world famous Chelsea Flower Show and this seasonal venue makes the perfect space for any outdoor event. It is an adaptable area that can be used for barbeques, fun days, sports events, drinks parties and children’s events, accommodating up to 200 guests. The Royal Hospital Chelsea can offer private and secure parking for your guests for the duration of the event.